N.A.R.F. is into electronic music, preferably techno, tech house and progressive tunes since '94. 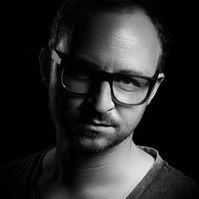 Born and raised in Düsseldorf – one of Germany’s techno meccas – he was musically influenced by the local clubs (especially the legendary Tribehouse and the tremendous 102). You probably will notice this two-decade experience while listening to his sets. N.A.R.F. loves any kind of infectious, wicked electronic music going straight forward and making people raise their hands towards the club sky. "This is a name I got from an old lady which I helped in the household on a weekly basis. At this time (1994) I was working for the social organisation CARITAS since I rejected to do the military service and took the choice to engage in the civilian service. As I was introduced to the old lady I told her my name: Lars. As the lovely lady was at an age she lost all of her teeth already which I haven't realised in that very moment, she said: "Ahhh, Narf, you are welcome". I responded "No, it's Lars" and she said "aaaaaaaah Naaaarf" and me again "Noooo, it's Lars, not Narf" and again she was saying "aaaaah, I see, Narf". That was the point where I resignated to teach her my name and I accepted her to call me Narf, each and every week." Funny enough to use it as a dj name, isn't it?